Greyhound protection group ‘CAGED North West’ was formed in early 2012. As Greyhound Action had just ceased campaigning and the only remaining greyhound protection group that continued to politically campaign was Greytexploitations, we felt there was a desperate need for more campaigners and decided to wholeheartedly jump on board. We believe there is still a great shortage of campaigners and this denies the dogs the help they desperately need. The intentions of CAGED are to cover all bases; exposure of the cruelty and corruption within the racing industry, education, political lobbying and using new methods to raise mass awareness. We want everyone to be aware of the truth. We present cases that are well documented, regardless of this we have been threatened with legal action on occasion. We will continue our work and will not be backed into a corner for speaking the truth. If any person does proceed to take legal action against us, we can only hope we gain more public support in the process. The exposures are never personal, we have no intention to become personal with individuals who exploit the dogs, and our battle is with the greyhound racing industry as a whole. In order for us to bring the industry down, we must expose the individuals who exploit the dogs, they are part of the industry and the worst culprits being those greyhound trainers and owners who keep large numbers of dogs. The industry itself is in debt and we do not believe the GBGB (Greyhound Board of Great Britain) can afford to help maintain large numbers of dogs when a greyhound trainer fails to look after them, this would serve no purpose to the industry and would not be cost effective. When we began campaigning we could not believe the injustices within the law and that such industry is permitted to be a self- regulated one, disciplinaries that are almost worthless and re-introductions of legislation that continuously fail to protect the dogs. In 2006 The Sunday Times exposed the case of David Smith, a builder’s merchant who slaughtered around 10,000 greyhounds by use of the captive bolt gun in his back shed, he claimed he was providing a service, just as Holts abattoir were also providing a similar service in 2008. An undercover reporter was told by Holts it was “no problem” to put down greyhounds that he simply no longer had room for. “We do it (putting dogs down) for quite a few of our greyhound trainers,” said Alan Waller, who runs the knacker’s yard. “We charge £20 for a dog. It’s better than the vet.” The Sunday Times investigation led to some controversy in regards to the law and use of the bolt guns. David Smith was not charged other than for breaching waste legislation. It remains legal for any lay person to destroy greyhounds by use of the captive bolt gun. Registered Greyhound litters in Ireland 2011 = 3,271. Conservative estimate of 7 pups per litter = 22,904. Less than 16,000 greyhounds were registered to race in 2011 at 12 months old, taking into consideration the amount of hounds that retire each year due to age, injury etc. It is estimated between 8,000 to 10,000 go missing each year presumed dead. Approximately 22% of Greyhounds are bred in Britain and 78% come from Ireland. An estimated 22, 904 bred to race in 2011, yet only 16,000 made the grade! Nobody knows what happens to the puppies that do not make it to the tracks. Sadly this only scrapes the surface as it’s not just the dogs that don’t make the grade who are destroyed, even the winners eventually become worthless. This is not just about figures but a reality of bloodshed hidden behind the scenes of the racing industry; worryingly there are much cheaper methods of destruction than euthanasia by intravenous needle. A female greyhound’s body was found dumped in a secluded spot in Oxhill –Stanley, with a large impact wound to her head. Greyhound protection groups Greytexploitations and CAGED North West are offering a reward of £1,000 for information that leads to the arrest and conviction of the person or persons responsible. The greyhound – now named Angel by her finder – was micro chipped with the serial numbers starting 0981 which determines she was chipped by the Greyhound Board of Great Britain to race on a licenced track. Angel was also tattooed but due to the advanced decomposition of the body – the full tattoo is illegible. It is estimated that around 1500 greyhounds fall to their deaths annually on UK tracks. Due to the configuration of the tracks the 1st bend is the most lethal, this is where the majority of falls occur. Injuries vary from broken necks to treatable injuries such as a broken hock or toe, if a minor injury is likely to hinder the dogs future performance, he or she may be destroyed. It is more economical for the profit maker to request that the track vet euthanizes the dog, as the cost is usually much less than attending a private vet and only a little more than paying an abattoir to use a captive bolt gun. Injuries are sometimes left untreated, some dogs are also forced to run while baring injuries, this is when it is most likely that trainers/owners will administer drugs such as steroids and other drugs to a dog to mask the pain and decrease inflammation, so the dog can continue racing without showing obvious signs of pain and distress, another reason for doping the dogs is to race fix. We would say that this statement implies that data would be extremely shocking to members of the public, if it was to be released. Westmead Hawk May 2003 – 26 May 2014; Recognised by the industry as a champion racer, who earned his owner £200,000 during a double Derby win. He was used as stud after he sustained a broken hock while racing at Hall Green stadium, just a month after the 2nd Derby in 2006. Westmead Hawk sired a total of 4847 pups. Champion dogs are exploited too, many kennelled throughout their lives to serve as a breeding machine. Breeding of greyhounds is generally carried out by the method of Artificial insemination. This campaign continues to grab the attention of people from around the globe, with almost 100,000 signatures online as well as several signatures from MPs and support from many highly experienced veterinary professionals. A captive bolt pistol (also known as a cattle gun, stun bolt gun, bolt gun, or stunner) is a device used for stunning animals prior to slaughter. The principle behind captive bolt stunning is a forceful strike on the forehead using a bolt to induce unconsciousness. The bolt may or may not destroy part of the brain. We can only hope that DEFRA (Department for Environment Food and Rural Affairs) feel some shame for permitting such a cruel death; a callous end by a bolt to the head can only define a state of worthlessness for these dogs. What vets have to say about inhumane use of the Bolt Gun used to kill thousands greyhounds that have outlived their purpose. “As a small animal veterinary surgeon with 15 years clinical experience, I cannot begin to imagine how the use of the captive bolt can be justified In small animal patients, including in aggressive dogs. I have unfortunately had to euthanize a number of aggressive dogs and I’ve treated others. It is simply not possible to get close enough to the head to use a captive bolt, even if I did believe this was a humane technique, which I do not and neither does my professional body the RCVS.” – Caroline Allen, Veterinary surgeon MA VetMB CertSAM MRCVS and Green Party Spokesperson on Animal Issues– 15 years Veterinary experience. CAGED have held presentations at Masonic lodges, golf clubs, Rotary clubs and colleges in the North West. We believe people should be able to make well informed choices of whether to support the racing industry, this could mean from attending a track to volunteering for a non-independent rescue that is funded by the racing industry, many people are unknowingly participating in the cruelty. Tens of thousands of greyhound dogs are retired each year, but only a fraction of these are re-homed. The fate of the rest of these dogs, who have not even reached half their expected age by the time they retire from racing is a gruesome death. They are inhumanely slaughtered: starved to death, beaten to death, dismembered, put down by a Bolt gun and more. What happens to the thousands of unwanted puppies? – In May 2004 Rusty was found whimpering in agony on a Welsh hillside (Fochriw Mountain in the Rhymney Valley). His injuries were so severe that he died shortly after being found. His ears had been hacked off and there was a hole bored into his skull caused by the use of a bolt gun. Despite all this pain and suffering Rusty still managed to wag his tail when he was found. He was last raced under the name “Last Hope”. Mutilating the ears of greyhounds is not uncommon. Legislation says that all greyhounds registered to race must bear a tattoo in their ears to help trace their owners when abandoned. Irish Greyhounds must have a tattoo in both ears and English bred greyhounds must only have a tattoo in one ear. Around 80% of English greyhounds are imported from Ireland. – Norman, an 18 month old greyhound, was found abandoned with his ears hacked off. His ears were so badly mutilated that his owners could not be traced from his ear tattoos. Mid-Antrim Animal Sanctuary and nursed him back to health. As far as we are aware a recent vet visit confirmed that Norman also had a fractured skull as he had been having seizures and underwent an MRI scan to find the cause. Norman has been rehomed to George, the chairman of the management committee at the sanctuary. In 2013 CAGED held a Campaign to help close Westhoughton Greyhound stadium in Bolton. CAGED Campaigners made the Bolton news when they handed over 1,000 postcards into Bolton Town Hall. The postcards called for closure of the stadium and were mainly signed by Bolton residents, an additional 700 postcards were also later submitted from people around the North West. In late 2013 demolition of the stadium began. Wimbledon Greyhound Stadium is hanging in the balance.CAGED have begun distributing a similar postcard to that used in the Close Westhoughton Campaign. Requests have been coming in thick and fast for the Close Wimbledon Campaign Postcards that quote ‘Keep cruelty out of the capital’ ‘Say YES to the closure of Wimbledon’ Within the first fortnight of the campaign CAGED received a response from Merton Council to say they were in receipt of almost 1,000 completed postcards. Lush Wimbledon have also been supportive to the campaign and had agreed for an event to be held by CAGED Campaigners inside their retail outlet. Around 180 postcards were completed by Lush customers and later delivered to Merton Council. On January 26th the Greyhound Board of Great Britain held an Awards ceremony at the Hilton Hotel in Manchester, for greyhound trainers and owners to celebrate their achievements. CAGED united with other campaign groups to make this event a special one. CAGED North West, Greytexploitations , Pet Levrieri (Italy) and the Shut Down Belle Vue group united for this big event. Around 400 protesters attended, many were simply owners of abused greyhounds that came along to be a voice for the dogs past and present. Pro Greyhound held a parallel event in Germany, as well as Pet Levrieri in Italy. This event was an unforgettable one for all who attended, including the greyhound racing industry who will have clearly felt the pressure. We expected around 100 protesters, we had no idea that people would travel from so far away, one lady named Brenda had travelled from Canada.The police kept their cool and maintained a high level of professionalism throughout the protest. The event was in respect of the dogs and we were fully confident that people would not break this respect by acting inappropriately. A minutes silence was held in respect of the million plus greyhounds that have died since 1926. While the Champagne flowed inside, tears flowed outside. The minutes silence was heart wrenching for many. 400 people held their breath without a single murmer, heads were held low, there were cold red noses and tears streaming down people’s cheeks, young and old, men and women from all walks of life looked completely devastated. No doubt many terrible thoughts were running through people’s minds, about the past suffering of their own greyhounds as well as the pain, fear and loneliness suffered by others to this day. A special event will be held in Manchester this greyhound remembrance weekend. Greyhound protection groups and rescue centres will be holding stalls and a special display in memory of the dogs that have lost their lives due to the racing industry. More details can be found on the website shortly. 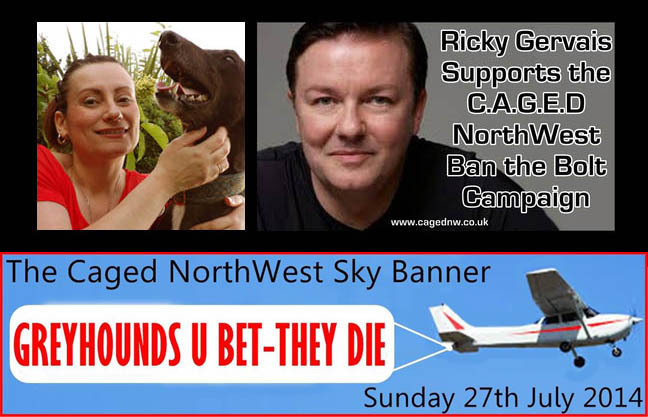 CAGED have arranged for a large sky banner to be flown over the North West of England on Sunday 27th July 2014. The banner will carry the words ‘GREYHOUNDS U BET –THEY DIE’ The flight will commence during lunchtime and will take off at Blackpool to cover most areas of Manchester before moving on to Warrington, St Helens and Liverpool. Rita James, Founder, CAGEDnw – I was born in Surrey, UK in 1968. I was raised with cats, dogs and rabbits, my grandparents were farmers and my parents had both often viewed farming processes that involved cruelty to animals. During the 70’s times were difficult, we could not pick and choose what we ate. When I was five years old I was given a meal with lamb’s kidneys. I immediately associated animal physiology with human physiology, I told myself that if an animal had similar organs then they would also have similar feelings. I was too frightened to air my views, so I chose to quietly play with the food on my plate, my father asked me to eat and I finally mustered up the courage to say No. I was ordered to stay at the table until all my food was eaten. I sat glaring at my plate for three whole hours after my bedtime, eventually I was allowed to leave the table. Contrary to my father’s aim, this punishment was beneficial to me, it taught me how to become outspoken. In 2006 I read about the undercover investigation into David Smith and the destruction of 10,000 greyhounds by use of the captive bolt gun, I was appalled by the outcome. I had just terminated my business of 10 years due to illness and was convalescing after surgery. I vowed that on my recovery I would help the greyhounds. I now devote all my time to my animals and the Campaign, with age I have gained self- awareness. I achieve much more gratification from helping others, than I did running a business to enhance my own prospects.